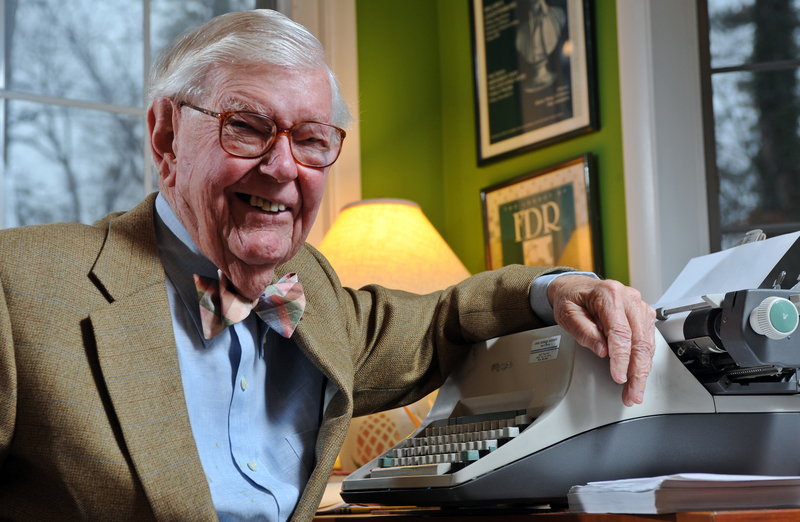 Emeritus UNC College of Arts & Sciences history professor William Leuchtenburg talks his new book, 20th-century presidents, and the personal experiences that shaped his understanding of them. William Leuchtenburg is the William Rand Kenan Jr. Professor Emeritus of History at UNC. He’s written 15 books on the American presidents, eight of which are solely on Franklin Delano Roosevelt (FDR) — of whom he is the world’s leading scholar. Leuchtenburg, a historian who taught at UNC-Chapel Hill for 20 years, has spent his whole life getting to know the American presidents. He’s written 15 books about them, eight of which are solely on Franklin Delano Roosevelt (FDR). In fact, he’s the world’s leading scholar on FDR, a man he’s idolized from the time he was 9 — when he first heard his presidential nomination during a 1932 radio broadcast. Upon FDR’s death, a 23-year-old Leuchtenburg wandered around New York City lost for days. “It did seem as though I’d lost my father,” he admits. In his most recent book, “The American President: From Teddy Roosevelt to Bill Clinton” (2015), the 93-year-old scholar presents an anecdotal account of our nation’s 20th-century presidents. Each one overflows with wit and intrigue, and reads more like a literary novel than a history book. His words are shaped by research and real-life experiences — he’s met a handful of these leaders, some of whom had a greater impact on his life than others. Harry S. Truman and Lyndon B. Johnson are two of them, both of whom were forced to follow in their predecessors’ shadows. Here’s a view of their lives from Leuchtenburg’s perspective. Nobody thought a president succeeding the man who got America through the Great Depression and most of World War II would survive a second term. “Truman was always talked about and depicted as the little man following FDR,” Leuchtenburg explains. But, in truth, he was a man of average height and full of surprises. Upon entering the presidency after FDR’s unexpected death from a cerebral hemorrhage in 1945, Truman was anything but “Mr. President” to both the American people and those in the White House, according to Leuchtenburg’s book. In fact, it wasn’t until two weeks after he took office that Secretary of War Henry Stimson felt confident enough to tell him about the atomic bomb. Four months later, Truman approved the drop of what he called “the most terrible thing ever discovered” on Hiroshima and Nagasaki. Japan surrendered five days later. The war ended. And the strikes began. Workers in the automobile, steel, and railroad industries protested for one year after the war. No one thought Truman would be reelected. But he persevered. He created the Department of Defense, National Security Council, Central Intelligence Agency, Atomic Energy Commission, and was the first president since Abraham Lincoln to truly make a stand for civil rights. In 1946 — nearly 20 years before John F. Kennedy’s Civil Rights Act passed — he established a President’s Committee on Civil Rights. He desegregated the military and was the first president to ever address the NAACP. And no one thought he’d be reelected. Truman campaigned hard. He traveled more than 30,000 miles by train across the country, stopping in nearly every major city, met by hundreds of thousands of Americans waiting to see what the “gone goose” had to say. He spoke of civil rights and the housing crisis, criticized the Republican Party, and fulfilled his promise to “give [the American people] hell.” He gave 271 speeches and won over his listeners. Still, no one thought he’d be reelected. At 9:30 a.m. on Nov. 3, Leuchtenburg stopped for breakfast at a Kansas City drugstore. A radio announcer came on the air to report that the presidential election was still in doubt, but had come down to the state of Ohio. “The music came back on, but was again interrupted by the radio announcer,” Leuchtenburg remembers. “Harry Truman — to everyone’s astonishment — had been reelected president. Three weeks later, around midday, Leuchtenburg headed to his local shoe repair store in Dobby Ferry, New York. Upon entering the shop, he noticed the owner wore an odd expression on his face. “He looked stunned,” Leuchtenburg says. “I thought maybe he was having some kind of psychotic episode. And then, finally, he blurted out: ‘The president has been shot.’” Leuchtenburg bolted out of the shop, hopped in his car, and sped home, where he flicked on the television. “President Kennedy is dead,” a reporter announced. “It was the first time my children probably ever saw me crying,” Leuchtenburg recalls. Like Truman, Lyndon B. Johnson lived in the shadow of his predecessor. But, also like Truman, Johnson persevered. Shortly after JFK’s death, he called upon Congress to pass the Civil Rights Act of 1964 to honor the work of his predecessor. He declared a “war on poverty” and established the Economic Opportunity Act, which created a Job Corps, Neighborhood Youth Corps, Head Start, Community Action Program, and the Food Stamp Act of 1964. He also convinced Congress to make an $11.5 billion tax cut. By the end of 1965, 1 million unemployed Americans found jobs. By 1969, the poverty rate had decreased by 9 percent since 1959. The Civil Rights Act finally passed five months later and created an Equal Opportunity Commission to ensure fairness in hiring. Immediately after, Johnson knew in his heart that the decision would cost him the support of most southern states. For more than 30 years, he’s worked with American filmmaker Ken Burns on documentaries like “Baseball,” “Prohibition,” and “The Roosevelts.” And he’s given lectures on the American presidency nearly everywhere imaginable, from the Franklin D. Roosevelt Library in Hyde Park, New York, to Ben Gurion University of the Negev in Israel, to Moscow State University in Russia. William Leuchtenburg is the William Rand Kenan Jr. Professor Emeritus of History at UNC-Chapel Hill. He taught history for 20 years there before retiring in 2002. Prior to that, he taught at Columbia University for 30 years. He’s written 15 books on the American presidents, eight of them on Franklin Delano Roosevelt, of whom he’s considered the leading scholar in the nation. This entry was posted in Society. Bookmark the permalink.